On the this year’s Milan Furniture Fair Moroso has presented its novelties for 2011 and even dedicated an installation called “Twilight” to the new Moon Chair. Moon Chair and Twilight installation were designed by the recently honoured as Designer of the Year 2011 Tokujin Yoshioka. The Twilight installation immersed Moroso’s showroom on the Milan Furniture Fair in a shiny twilight with helping light and water, and where the new Moon Chair has been presented in the middle. Moon is a chair that got its appeal out of the moon’s lights and shadows beauty that suddenly shines and disappears again”, that is how Tokujin Yoshioka describes Moon whose design was inspired by the observation of natural processes. Tokujin Yoshioka and nature – the designer finds infinite inspiration in it. For its numerous nature inspired designs the Japanese designer has been selected Designer of the Year 2011 (German site) in the beginning of the year, by the magazine A&W Architektur & Wohnen. This decision was explained with this words: ”the Japanese designer Tokujin Yoshioka, 43, designs furniture transparent as air, chairs like honeycombs, installations like clouds – his ideas are inspired by phenomena and the beauty of nature.” Within the awarding, aligned by A&W Architektur & Wohnen and staged by Tokujin Yoshioka there has been an exposition with a unique profile of his works. On the A&W homepage there is an images galery (German site), and a video about the awarding ceremony and exhibition opening. 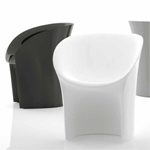 The Moon Chair by Tokujin Yoshioka is not the only novelty from Moroso for the year 2011. Further new products are: Pond from Nendo, Biknit and Gentry from Patricia Urquiola, the Chair Impossible Wood by the designers Nipa Doshi and Jonathan Levien, Button Down, a system-cushioned furniture in the Edward van Vliet design, the Booklet Chair, designed by Toan Nguyen and Filigrana, a stool by Elena Manferdini. 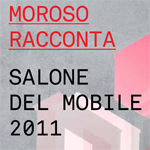 Find further information and images of the products that were predented on the Milan Furniture Fair by Moroso in the PDF-catalogue (in German) of the Italian Company.